MANILA (Mindanao Examiner / Oct. 23, 2011) - It is common knowledge that the country’s educational system is facing a host of challenges. High population growth, limited school capacity, poverty and other factors have led to high student dropout rates. In addition to the problems of the formal basic education sector, there is large group of learners who are not adequately served by the education system. In 2007, there were more than 11 million out-of-school youth and non-literate adults in need of alternative basic education. Reaching this vast sector requires strengthening the country’s alternative education system which is based on non-mainstream or non-traditional approaches to teaching and learning, such as non-formal education, distance education, and work-based learning. The government acknowledges the importance of AES in the attainment of the goal of ‘Education for All’. The Department of Education’s Bureau of Secondary Schools implements alternative education programs for high school students who are unable to go to school on a regular basis, such as the Modified In-School Out-School Approach and the Open High School Program. DepED’s Bureau of Alternative Learning Systems provides community-based basic education and life skills programs to out-of-school youth and adults, and indigenous peoples and communities in remote areas of the country. The Commission on Higher Education has established a Technical Panel for Alternative Learning Systems that would guide tertiary education for ‘ALS implementers’. At present, there are about 2,000 mobile teachers for more than 42,000 barangays nationwide. Not only does the sector need more teachers, CHED’s technical panel for ALS also recognizes that those working in ALS sectors need to develop a wide repertoire of skills. “Expanding the education provision to all sectors and throughout the life cycle would require developing education professionals with a critical understanding of educational priorities and challenges especially in a developing country context, as well as the competence to address these challenges,” said Prof. Patricia Arinto, Dean of the UP Open University’s Faculty of Education. “Such education professionals should not only be grounded in the concepts, principles of education, but also have the ability to recognize and organize learning environments into systems that would foster effective lifelong learning, They must have the skills in teaching, materials development, learning management, use of technology, community organizing, advocacy and social mobilization, as well as life and survival skills,” she added. 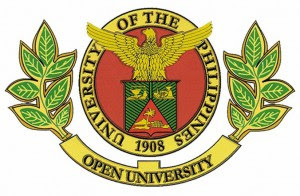 To develop education professionals with these abilities, the UP Open University shall offer the Bachelor of Education Studies in May 2012 with two areas of specialization – Alternative Education Systems and Instructional Design and Technology. AES majors will develop professional competencies for a career in alternative education sectors, such as non-formal, community-based education and work-based learning, and school- or institution-based alternative delivery modes, such as distance education and online learning. The IDT specialization addresses the need for education professionals with expertise in the systematic use of technology to address educational challenges both in school-based and alternative education environments. “Over the last decade we have seen how advances in information and communication technologies had fuelled interest in the application of technology to improve access to education and enhance teaching and learning. IDT majors will have a solid foundation in the theory and practice of design, development, utilization, management, and evaluation of processes and resources for learning,” Arinto said. Since BES will be offered online, it is ideal for individuals who are qualified for a college education but who are unable to attend conventional colleges or universities, and those who are already involved in education work but do not have the formal educational preparation for it. “Because they will remain in their communities while they study, we hope that BES students will develop or strengthen their commitment to serving as education professionals in their own communities or in places facing similar development challenges,” Arinto said.